If you have plans to remodel your kitchen in 2016, you have so many top kitchen remodeling trends to look forward to. Out with the old and in with the new! 2016 is all about adding unique touches that are both beautiful and smart—adding great aesthetics as well as functionality. Kitchen remodels offer the highest ROI of any other room in your home, especially when you pay attention to current trends. 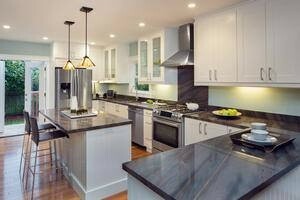 Let us help you plan the perfect kitchen remodel with these top kitchen remodeling trends of 2016. Your countertops can make or break your kitchen, after all they serve as a place to prep, cook, and store things. Not to mention, there’s a lot of countertop surface space for people to look at. Therefore, it not only needs to look good and match your overall kitchen décor, but also it needs to be durable and functional for all your needs. In past years, it was all about creating countertops that fit a very ordinary mold. Detailing was generally limited and square or round countertop edges were good enough for even high-end kitchens. Darker colored countertops have also remained popular for many years. Say goodbye to plain and hello to detailing! Countertops are getting some serious upgrades in order to stand out from the rest. This year, expect to see a more contemporary look, for example, countertop planes that extend all the way to the floor (known as a waterfall countertop), or mitered edges that provide a more sleek and sophisticated look. Lighter colored countertops are rapidly gaining popularity, and expected to continue so throughout 2016. Kitchen cabinets are one of the largest chunks of money during a kitchen remodel. This is because they are a HUGE part of your kitchen. They set the stage for style while also providing you with a convenient, or not so convenient, place to store all of your things, from food to utensils. All cabinets tended to be the same color back in 2015, just as all cabinets included the same doorknobs and accent designs. 2016 kitchen cabinets are getting a big upgrade in terms of diversity. For instance, it’s not uncommon for people to ask for two-tone kitchen cabinets. Designers rooting for this new trend recommend keeping all upper cabinets white or a different neutral color to create a clean and timeless appearance. They suggest using an entirely different and bolder color for lower cabinets. Using two different wood tones is a great way to utilize this design idea, for instance break up cabinets with lighter wood on top and darker wood on the bottom. Flooring is everything. Your floors must be durable enough to withstand all of the wear and tear that goes on in the kitchen, but they also need to look great and complement your style. Perhaps most importantly you need floors that are able to last for a long time because no one wants to replace kitchen floors all the time. Cold houses with cold kitchen floors equates to higher heating bills. One of the latest and greatest floor trends of 2016 is heated flooring. There are multiple ways to install heated floors, which can be installed under many different flooring materials. Heat naturally rises, so when the floors are warm, you are warm. Advocates for heated floors say they pay you back over the long haul by reducing traditional heating costs. What is your core color theme for your kitchen remodel? There are countless color shades and so many ways to mix and match your favorites. The big color of 2015 was black, as more and more people installed black kitchen cabinets, countertops, and so forth. Prior to black, the most popular kitchen color was white. White and black both remain good color options for the kitchen. These classic colors never go out of style. That being said, people are getting crazier with kitchen colors this year. Don’t be afraid to use bold colors in your kitchen, or even mix and match colors used on cabinets and other key elements. The push to go green is greater than ever, and for good reason. Homebuyers are becoming increasingly concerned with how energy efficient a home is. Adding a couple eco-friendly touches to your kitchen is what you need to please the planet and future buyers! Bigger is better and who cares about hogging up energy and resources? This way of living has led us down a path of environmental destruction. As a result, more and more people are looking for ways to go green. You can transform your kitchen into a greener space by simply installing LED lighting, or purchasing the latest energy efficient appliances. Take it one step further by installing heated floors. You don’t have to spend a fortune on your 2016 kitchen remodel! Tops Kitchen Cabinet offers affordable wholesale prices on high quality cabinets, granite countertops and more. Check out our huge selection of inventory today and start planning the kitchen of your dreams.